Well, Well, every few years another device comes along that people look at as the potential end all be all for flight simulators. Many of us have spent small fortunes on HOTAS Controls, fancy input devices, high quality mice and various other gadgets (anyone remember the Saitek PC Dash? Huh?) which supposedly improved the immersion in the game and promised to give the flier that ‘edge’ over the other guy. Some of these are fairly successful, some less so, some border on ridiculous. Some voice recognition software has been found to be fairly useful. Other items, like Roger Wilco improve multiplayer sessions by allowing communication between participants. Others, like many of the input devices (i.e. PC Dash, MS Game Commander) really don’t cross over all that well to a flight sim environment. Some of the stuff is downright amazing — look at some of the more expensive items for sale here at Flight Sim Central. But the cost is really out-of-line for what most of us can afford. Probably the biggest bar to the feeling of immersion has to be the restrictions posed by the monitor. Not only do you have the problem of depth perception and peripheral vision, you also have to deal with the difficulties of simply looking around in the cockpit. Some relief has been accomplished with Hat switches, virtual cockpits and mouse views but overall the ‘fixed forward’ type view is not only unrealistic; it tends to make situational awareness difficult. Unless you are Bill Gates and have the cash to create a complete virtual cockpit around you gamers have had to deal with what has to be the biggest limitation in PC flight simulation today. 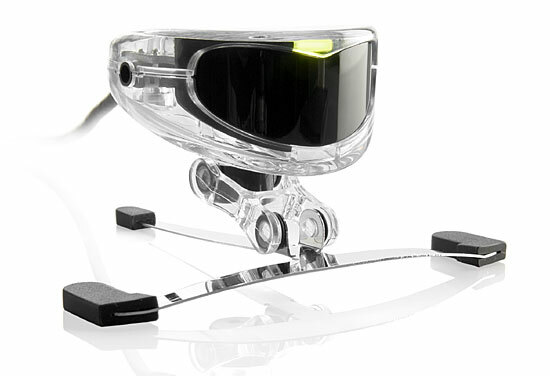 About a year and a half ago, NaturalPoint came out with theTrackIR, a gaming version of the Smart-Nav system, a device designed for the handicapped that used a sensor and reflective dots to emulate the mouse. 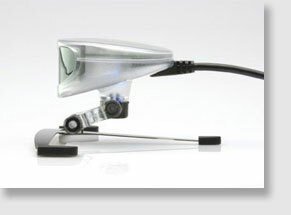 Simple in concept, basically the Smart-Nav is a video device that uses reflective dots to control mouse movement. In other words, it is a hands free mouse. Perfect for those with disabilities like spinal cord injuries the device is a reasonably priced device that allows those with disabilities the chance to get on the computer. 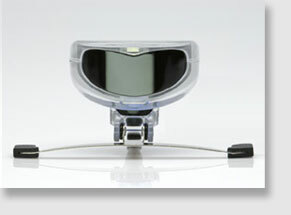 The TrackIR is more of a Smart-Nav “lite”. Somewhere along the line someone came up with the idea that this mouse emulation device might work well with some games currently in production. More specifically, it looked like it might work very well with some of the newer flight sims coming out. Developers like Oleg Maddox immediately recognized the potential of this device and supported the game with IL2: Forgotten Battles (IL2:FB). Other games like Lock On: Modern Air Combat (LOMAC) andFlight Simulator 2004 (FS2004) support the use of the device. Basically, if a game supported the “mouselook” function it would work with the Track IR device. The newest device from NaturalPoint is the Track IR2, an updated version of the device that improves the shutter speed of the device and claims to have improved the smoothness of the panning as well as the accuracy of the device. I have an early production version of the device as well as the latest version of the TrackIR software and am running the device through its paces for the first time. Let me say this, I have never used a TrackIR before receiving this device and wasn’t sure exactly what to think of it. I have heard gamers on the IL2:FB boards simply rave about the TrackIR but until recently hadn’t thought a whole lot about buying it. I decided that the device would be my little ‘gift to me’ after my deployment. I originally ordered a TrackIR “1”, but NaturalPoint upgraded it to a TrackIR2 since the new version was so close to shipping. This was a nice bit of customer service if you ask me, most places would have shipped an older device but NaturalPoint decided to wait and let all people close to the shipping date decide if they wanted to wait.